A new book, "Space Exploration for Dummies," boils down rocket science for the masses. You?vealways been a space cadet at heart? So have I. My Dad took me out to seeSputnik glint in the night sky, and the rest is history. I still have my 5thgrade report that stated I planned to work for NASA when I grew up. Well, thatchildhood dream has been largely fulfilled through the work on NASA programslike Kepler, Astrobiology and SOFIA. For me, it all started with the spacerace. Early on, every space launch made the front page of thenewspaper and the evening news. We watched Russia and the US launch dogs,monkeys, insects, chimps and, ultimately, men up into space. The Russians werenot only the firstto space, but the first to send a woman into space. This was tremendouslyexciting. Today, I regret that people have become accustomed to humans goinginto space, and that the launches are relegated to the inside pages of thenewspaper. The repair of ?thepeople?s telescope,? which restored and improved Hubble, did make the news,and excited many folks around the world. But, like many people, I don?tremember each and every piece of space history and lore. And, I?m delighted tohave a new book in my personal library that brings together a brief history ofspace exploration under one cover. 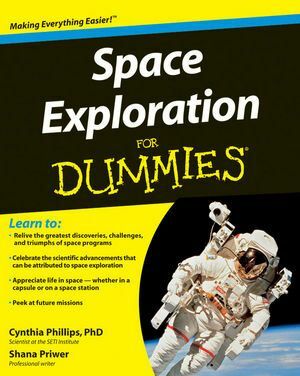 ?Space Exploration for Dummies?is the latest addition to the yellow-covered ?Dummies? series. Researched andpenned by Dr. Cynthia Phillips, planetary geologist at the SETI Institute, andher partner, Shana Priwer, professional writer, this book captures theessential facts and accomplishments of the real space cadets. The bookinvites browsing. While organized into logical chapters, readers are urged tojump straight to the topic of greatest interest. In case you?re a noviceastronomer, there?s a quick light-hearted primer on basic astronomy. Then, it?son to rocket science. Phillips and Priwer have a light touch, and write for thenon-rocket scientist. This is rocketry that your grandparents could understand.Rockets carry up payloads, and often astronauts. So you want to be anastronaut? Turn to chapter 4 to learn about your ride. But, all you would-be astronauts,go on to read chapter 5 about space tragedies before consulting your lifeinsurance agent. Like 15th century exploration of the Earth, spaceexploration is dangerous. People do die trying, and the history of thetragedies is both thoughtful and sobering. It honors the people who made theultimate sacrifice in our journey to the stars. Back to1957: Sputnik was the first human-made satellite to orbit Earth. It was amazingto me, and still is. Over several chapters, ?Space Exploration? breezes throughthe early days of the space race and on to Apollo, Soyuz, Mir and the SpaceStation. It?s useful to have all of this brought together succinctly: manymissions and many astronauts at my fingertips. I especially appreciated theinclusion of the 13 women who worked to become astronauts in 1960, but wereexcluded by NASA for lack of Air Force pilot training (something they, aswomen, could not obtain at the time, p. 99.) Sally Ride was the firstU.S. female astronaut in space 23 years later. Times do change. Robots andremotely operated space telescopes are essential human tools for spaceexploration. The authors devote chapters to robotic exploration of the Moon,the first grand tours of the solar system in the 70?s and 80?s, and the newerexplorers of our universe including space telescopes like Hubble. We?re in themidst of this exciting journey, and Phillips and Priwer scan forward to themissions in planning and missions in dream stages. Finally for all the SETIfans, there a chapter on looking for life beyond Earth in our solar system andaround distant stars. ?Dummies? are known for humor, and this book closes with?tens,? a nice homage to David Letterman: 10 places to look for life, 10 waysthat space travel isn?t like the movies, and 10 everyday things brought to youby NASA (not Tang!). So, space cadets, teachers, kids and interested people,you?ll find ?Space Exploration for Dummies? a fun read and handy reference. For anautographed copy of ?Space Exploration for Dummies,? consider joining TeamSETI or upgrading yourmembership.